Katie Meyer: Your vote counts! You can only vote once in the national elections today, but you can vote once a day, every day in the So You Think You Can Write contest! Paradise Found is a romance novel set in a tropical location-the story of a small town girl, a big city guy, and a trouble making dog that brings them together. Your vote can help me win a two book publishing deal! It only takes a minute, and you get to read the whole book for free! Everyone wins! 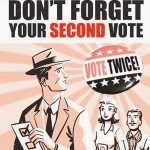 So vote twice today, once at the polls, and once for Paradise Found!